2014 Chevrolet impala has been bestowed with a very distinctive award by National Highway Traffic Safety Administration. It has managed to secure 5 out of 5 safety rating which makes it an ideal vehicle for families and safety conscious drivers. It seems like Chevrolet were on a quest to put together the most secure vehicle on the road. This is evident from the impressive array of safety features that have been incorporated into the new sedan. 2014 Chevrolet impala also has the distinction of being the first Chevrolet to make extensive use of radar technology to detect the density of traffic on the road and adjust the car speed accordingly. If the driver doesn’t react in time, the breaks are automatically applied. Chevrolet uses camera in addition with the radar to detect and warn the driver of a possible front collision. A camera mounted inside the rear view mirror detects and warns if lane is changed without signaling. There’s also a camera linked to a display in the dashboard which displays objects at the back of the car. This makes the driver aware of the distance between the object and the car, which helps immensely in parking. 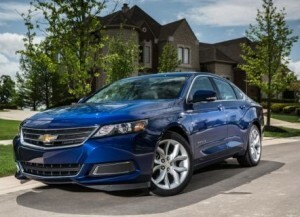 2014 Chevrolet Impala is also a very economical vehicle with an MPG of 21 City / 31 Highway. The safety features and recent accolades it has received, makes 2014 impala a benchmark setting vehicle in the market. Other vehicle manufacturers would be hard-pressed to match its fuel efficiency and plethora of safety features.